I Spy a new Kit…. Hello October!! I love it all……Pumpkin Pie, Pumpkin body and hand creams, Pumpkin Candles….we have it all in this house and all year round. But I figured this month was the perfect month to share my little Pumpkin obsession with you. This month for our kit theme we will be celebrating the homemade. Think of homemade treats, farmers markets, a little rustic combined with a touch of coziness and bright orange pumpkins. That’s what we are all about this month. 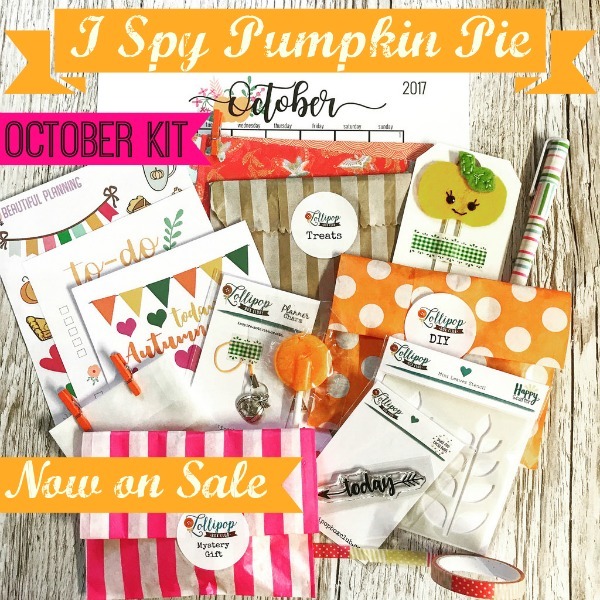 You will receive many Lollipop Box Club exclusives such as a stamp, stencil, stickers, 4 printables (with free codes to download for free if you subscribe), a handmade planner charm and large pumpkin clip. And other treats such as fun stationery, washi tape, patterned papers, a mini DIY kit, a mystery gift from a mystery collaborator, a big of treats and lots lots more… There’s always so much crammed in to these boxes. Lots of the kit will remain a surprise until it arrives and everything comes beautifully packed so it feels like you are opening a little box of gifts. Our blog will be filled this month with lots of handmade goodness inspiration, ideas and tutorials, including video links to our YouTube channel. Subscriptions are now open here if you would like to sign up. We also have a few one off kits now available. There will be a limited amount of kits made. All October kits will be shipped after the middle of the month.